I had wanted to play Rhino Hero for a long, long time, and had built up really high expectations for it. Luckily, and unusually, it absolutely lived up to those expectations. This game is great. Ostensibly, it is a kids’ game (ages 5+) so the premise is simple. Each player gets five cards, and the first player to get rid of all of their cards wins. You get rid of your cards by adding them to the ever-growing tower. You first lay down horizontally one or two folded cards to form ‘walls’, and then add a card from your hand as a ‘roof’ to the walls. This roof will have markings on it instructing the next player on how they must place the walls on their turn. And so the tower goes up, and up, and up. Some cards instruct players to pick up an extra card, reverse the order of play, or most interesting of all, add the eponymous Rhino Hero to the tower. He takes the form of a solid wooden meeple. Exactly the kind you don’t want to have to balance precariously on a tower of cards that might be 10 layers high. The first player to use up all of their cards wins, but more likely, and more often, the game ends when the tower collapses. In fact, in quite a lot of games, I have never actually seen anybody manage to place their fifth card. When the tower collapses, once you are done making fun of the person who collapsed it, you gather up the cards and play again. Because how could you not play again? We have actually played quite a few great card games recently. I talked a few weeks ago about playing 7 Wonders for the first time, and now we can add 7 Wonders Duel to that too. Only one play so far, but I think this is a game I am going to like. It functions almost exactly like regular 7 Wonders, but instead of passing your hand to the left and drafting one card at a time, now there are cards laid out on the table in ‘structures’. Effectively, these structures ensure that some cards are facedown, some are face-up, and some cards only become face-up (and available) after cards that may have been covering them have been picked. It’s a great replacement for the original mechanic, as it ensures you can always see a certain number of cards that will come available, but never all of them. In this way, it offers the same balance of strategy, but with having to adjust according to what becomes available – or not. As it is one on one, there is more direct interaction with your opponent. The game offers two ways to win an immediate victory, so if you see your opponent attempting this, you have to start playing against them and taking cards that they would need to win. Thanks to this level of improved player interaction, I think I may end up preferring it in the long run to its older brother. Time will tell on that one, though. On a final note, the nominations for the Golden Geeks have just been announced: you can find the list and all of the nomination categories here. It looks like a great selection, and we definitely agree with all of the games we have played being nominated. Sadly, that is a very small number of games this year, a fact which surprised me. Basically, we’ve played Fabled Fruit, Arkham Horror LCG, Kanagawa, and Scythe, but other than that the nominations are one big wishlist for us. Definitely something we will be looking to fix throughout the year, though. Perhaps Tabletop Cork can be of assistance to us in that regard? I’ve never heard of Rhino Hero before, and now I’s really like to play it! It’s super-cheap as well! No more than 10 LCEs (Local Currency Equivalent) I mean, how could you NOT buy that? And other games as well, I mean, you can’t go to the games store and JUST spend 10 LCEs. That would be rude. 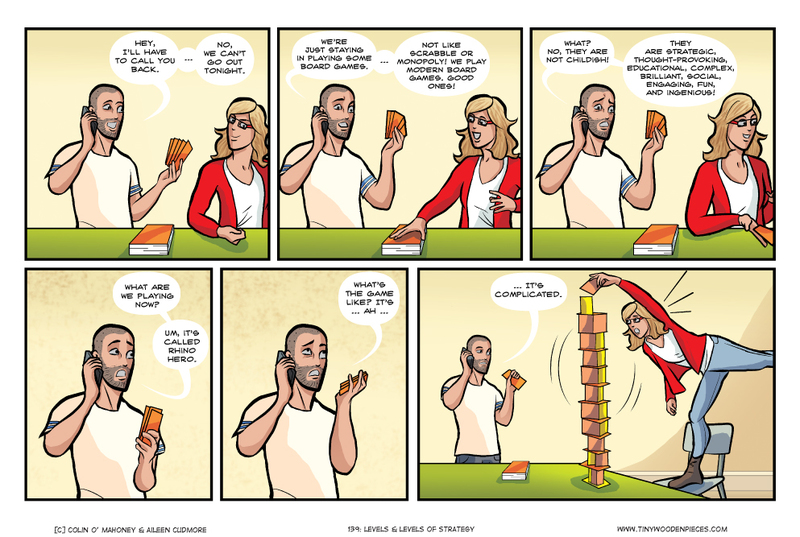 Coincidentally, I’ve both played Rhino Hero for the first time AND had that same conversation within the last week! Really? That’s hilarious! Also I guess it means the comic is striking the right chords? Hoozah! What did you think of Rhino Hero? Did you love it as much as we loved it? Mansions of Madness SE appearing so often in that list is making me even less happy about not having broken it out since buying it. We just haven’t had the time or chance to sit down with it, or indeed any game for weeks. We were going to rectify that this weekend but we’re headed to Cork. Perhaps a trip into Tabletop Cork while there will kill two birds with one stone. At least then we can try out something we don’t have! There’s a few other games on that list I’d love to try. Inis being chief among them, with Manhattan Project: Energy Empire a close second. Also, am I the only one thinking Pandemic is jumping the shark a little, lately? Cthullu is… well a Cthullu game more than a Pandemic one, and Iberia doesn’t seem to have much going for it beyond presentation. I mean, they’re both very pretty, and they’ll both have target markets (Cthullu is the new zombies), but I have some Pandemic fatigue at this stage. Yes! Come to Tabletop! I’ll be helping out there all day, and they have added quite a few new games to the library recently. Inis had such huge buzz this year, I’m dying to get a game of it, but I have yet to even see it for sale anywhere. It does seem to be getting to the point where Z-Man are sticking the Pandemic brand on as many products as they can. Having said that, I have heard from a few people that they actually prefer Iberia to regular Pandemic. And as for Cthulhu, well, I think gaming companies are contractually obliged to the Elder Gods to feature their poster-god in at least one new release every year. I have bought a few Haba games as gifts previously, hoping I would get to play them myself, unfortunately it has never worked out. Time to give up the pretense and just buy them for ourselves, I think. But with a rhino in a cape, which basically every game should have! Whaaaaaaaaaa-aaat! You’ve just made my day!